The pituitary gland is an endocrine (hormone producing) gland. It is one part of a special messenger system, helping to regulate a wide variety of the body's functions. The pituitary gland helps to control your body's functions by releasing hormones (special chemical messengers) into your bloodstream. These hormones are transported in your blood to their target. Here they usually cause the release of a second hormone. The target can either be specialised endocrine glands or other types of body tissue such as groups of cells. The pituitary gland is often called the 'master' gland because it controls several other hormone releasing glands such as the ovaries, adrenals and testes. About the size of a pea, the pituitary is found at the base of the brain, behind the bridge of your nose. The pituitary is very close to another part of the brain called the hypothalamus. The pituitary gland has two main parts: the anterior (front) pituitary and the posterior (back) pituitary. These two parts release different hormones targeting different parts of the body. Your body is in a constant state of change. Your heart rate, blood pressure and body temperature all change in response to what you do and your surroundings. Your body has special systems that constantly monitor these and other vital functions. Not only must these systems monitor changes, they must also respond and help the body restore balance. One of these systems involves the hypothalamus and the pituitary gland. 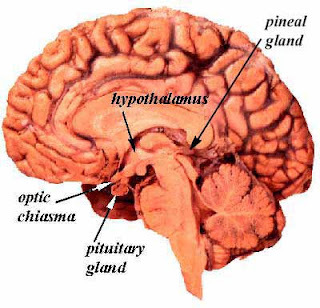 The pituitary gland hormones may then stimulate their target endocrine glands to produce their own hormones. These locally produced hormones do the actual work of regulating your body. For example, hormones produced by the thyroid increase the body's metabolic rate. In some cases high levels of locally produced hormones stop the hypothalamus and pituitary releasing more of their own hormones. This principle is called 'negative feedback', and it prevents hormone levels from rising too high. The anterior pituitary produces hormones that regulate a wide range of bodily activities from growth to reproduction. Whether a hormone is released by the anterior pituitary is governed by the hypothalamus. There are at least seven different hormones secreted by the anterior pituitary. The posterior pituitary produces just two hormones. Adrenocorticotrophic hormone (ACTH) Adrenal glands Stimulates the adrenal glands to produce cortisol. Cortisol is important in controlling your metabolism, blood sugar levels and blood pressure. It is also an anti-inflammatory agent, and helps your body to resist certain stresses such as bleeding or fasting. Stimulates the ovaries to produce an ovum (egg) for fertilisation. Also causes an increase in the hormone oestrogen. Growth hormone (GH) Many different cells of the body The most well known effect in children is to increase height. In adults and children it helps to control the amount of muscle and fat in your body. It also helps to heal injuries and promotes your immune system. Triggers ovulation - the release of what will become an ovum (egg) ready for fertilisation. Melanocyte-stimulating hormone (MSH) Brain? Exact role in humans is unknown. May influence brain activity, when too much is present may cause darkening of the skin. Prolactin Breasts Together with other hormones prolactin stimulates the breasts to produce milk. Thyroid stimulating hormone (TSH) Thyroid gland TSH stimulates the thyroid gland to produce its own hormones, triiodothyronine (T3) and thyroxine (T4). These hormones help to control many bodily functions including heart rate, temperature and metabolism. Oxytocin Breasts and uterus Stimulates contraction of the uterus (womb) during childbirth. Helps breasts to release milk.